From Goodreads: Life for Kansas was perfect until the day the world changed. She has been hiding out for four years in solitude. It’s the only way to survive. The only way not to draw the living dead. Helping a small group of people, she learns the new world might not be what she assumes. Venturing out of her refuge and comfort zone, she meets Rudy, who helps her find a greater purpose. She realizes that the world has moved on without her. Only it’s not what she expects. Her knowledge of the living dead grows and only makes her more curious as humanity continues to hang on by a thread. While on her search for answers she finds comfort in new friendships and love, but her past seems as if it will haunt her forever. Kansas takes it upon herself to help other survivors, which would be easy if the famished were the only obstacles. In a trilogy plot thick with twists and turns, this adult dark fantasy is emotional as much as it is horrifyingly gripping. 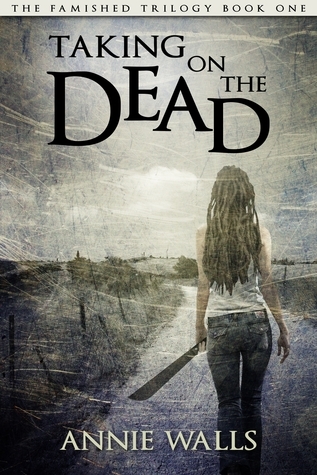 You can read my review of Taking on the Dead HERE!!! Hey everyone welcome to my stop on the Taking on the Dead release celebration. I pestered Annie until she agreed to do an interview. Here it is!! I hope you enjoy it as much as I do. 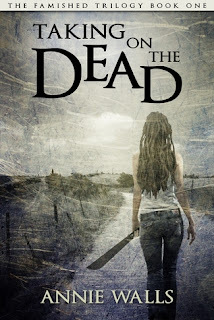 Annie Walls is Taking on the Dead! Let’s get the” get to know you stuff” out of the way! LP: Why did you decide to become a writer? AW: I didn’t really become a writer, I think I was born this way. I was always good writing papers, stories, and reading. I didn’t decide to publish anything until after I wrote Taking on the Dead. AW: Not a matter of who, but what…everything inspires me. People watching, the way my son plays video games with his tongue hanging out, a dog barking at leaves blowing across a yard… lol. LP: Is horror your favorite genre? AW: Hands down, without a doubt, but I like a little bit of everything. LP: Do you listen to music while you write? Do you have certain genre that you prefer to listen to? AW: I do listen to music. The genre depends on my mood. I have a playlist for every book in the Famished Trilogy, as well as my work in progress. LP: What is the biggest challenge out there for authors these days? AW: Coming up with new and original ideas to write about. It’s all been done. LP: If the zom poc happens do you have a list of people that you hope become zombies so you can umm take them out? AW: I’ll have you know I laughed out loud at this question for a long time. Yes, I do, starting with the crossing guard at my son’s school. Writer’s take their frustrations out on characters…it’s very therapeutic. I can’t tell you how many one page short stories I have on a flash drive killing someone off (One is about a crossing guard that tried to save a kid from getting run over, fails, and the kid comes back to haunt him. In the end, it’s all in his mind). Yeah, original. I should make an anthology. <~~ sarcasm. LP: A Velociraptor and a zombie get in a fight. Who wins? Keep in mind that the makers of Jurassic Park have them completely wrong. They are actually quite small. AW: Depends on the zombie. If the zombie is slow and shambling, it wouldn’t really have a chance. If the zombie is faster, more spry and agile…then I would pay to see what would happen. LP: Would you rather be eaten by a zombie, werewolf, vampire or go to a Justin Bieber concert? AW: Um, vampire. Maybe I would get lucky and the bite would be orgasmic. Definitely the best way to go. LP: What is your biggest guilty pleasure? AW: Contemporary Romance. I love that stuff, and just recently started reading it. Although, I have to weave through nine bad ones to find one good one. LP: What is up next? Any new project ideas for when The Famished Trilogy wraps up? AW: I have another series in the works! This one will be four or five books. I won’t know until the first is completed how far I’ll want to take it. Another dark fantasy, yes. I like my gory horror, action, and romance mixed into one. I delve into psychic’s in this one. I get to it every now and then, but I won’t be able to really go with it until I’m done revising Living with the Dead, The Famished Book Three. LP: Do tacos really make the world go around? AW: IMHO, yes. I love tacos! I'm a mother, and I love reading. What else is there to know? Great story, thank you for the giveaway! Thank you for the giveaway, enjoyed the interview. Lori when are you going to announce the winners for this one? Cindy Mucha Barton won. I cannot get rafflecopter to work right now. Ugh.